The Categorize Items page allows you to quickly categorize transactions, add details to your transactions in a simple format, and create category rules all in the one place! The number of transactions that need to be categorized will be displayed in the top left corner of the page. 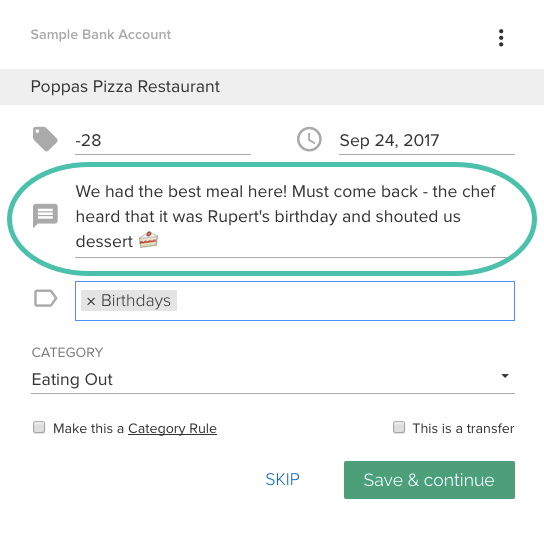 Add a note to your transaction as a helpful reminder or to create a memory for your Timeline! 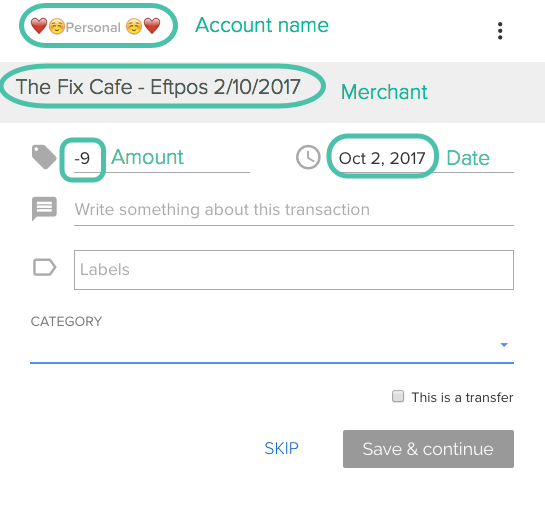 Add labels to your transactions! Labels allow you to tag transactions independently from categories. You can have multiple labels on each transaction. If you want to have this transaction marked with the Transfer icon just check the tickbox This is a transfer before clicking Save & Continue. You can create category rules to automatically categorize future transactions by ticking Make this a Category Rule, you can also edit the merchant name that will be matched for the rule to improve how well this category is applied in the future. To split the transaction, click the three-dot menu > Split. The transaction will then show on two cards so that you can change the details on each of the transactions. Changing the amount on one card will adjust the amount on the other card, so that they match the original amount.